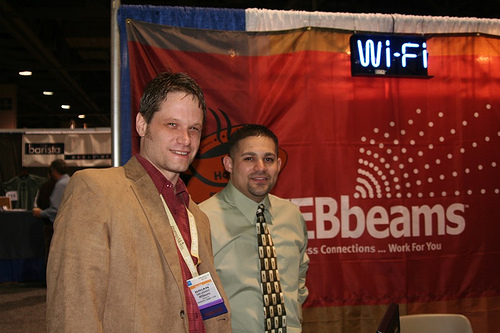 When Brian Van Lieshout and Chris Olson started WEBbeams, a WiFi hotspot service provider, they struggled to determine a good target market. They got help with focus and much more when they turned to SCORE counselor Larry Pelka. Olson and Van Lieshout met Pelka after attending a marketing workshop at SCORE in 2002. The two wanted to build a wireless hotspot service business to apply their technological and sales backgrounds in the emerging wireless industry. They set up a meeting with their counselor that would launch WEBbeams, now a nationwide industry leader in their niche. Counselors helped WEBbeams narrow their niche primarily to coffee shops. “The advice of being focused and finding a niche has really helped us as more competitors have entered the market,” said Olson. “They made us focus and learn our customers’ business so we could stand above competitors as experts in coffee shop business. Call 312-353-7724 to learn how business executives of SCORE can help you to start or run your business with free individual counseling and low cost workshops. You can learn more about WEBbeams at www.webbeams.com. Contact WEBbeams at 888-WEBbeams (888-932-2326) or sales@webbeams.com.